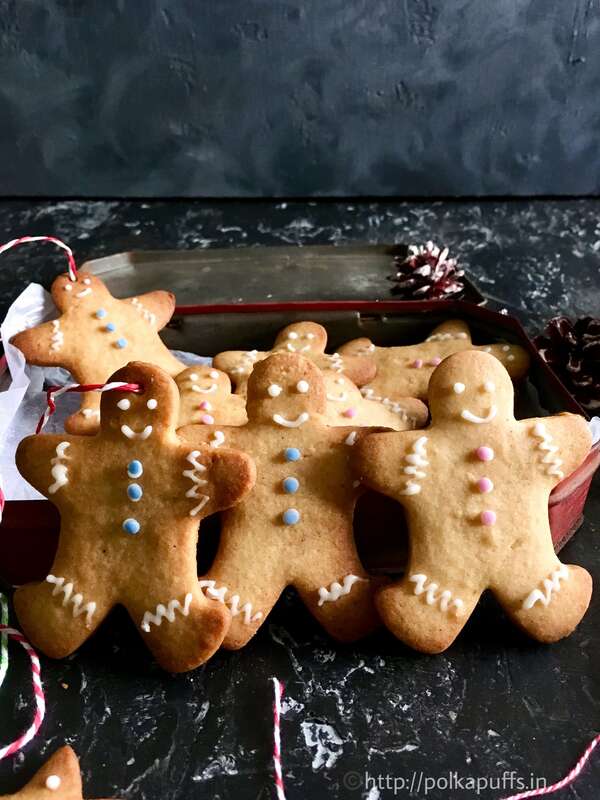 Traditionally, Gingerbread cookies are made with molasses and eggs besides flour, brown sugar, powdered ginger, mixed spices, etc. But I’ve never wanted to use molasses, there are two reasons for that. One being that I’d never be able to use up that entire bottle of molasses for any other recipe. Two, I’m not sure how will we like the flavor of molasses with ginger. 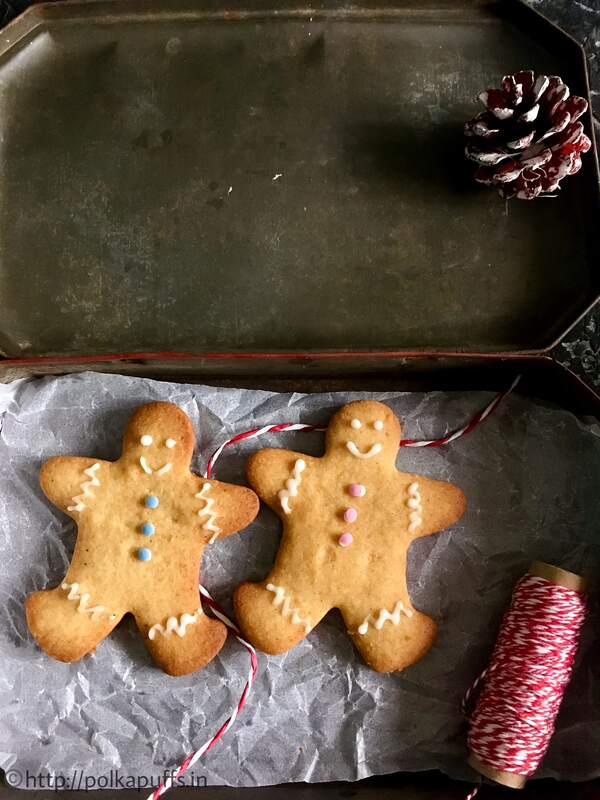 So, I just have been wanting to skip it and have read numerous articles online about replacing molasses in gingerbread recipes. They suggest honey or brown sugar/ demerara sugar for replacing the molasses. But, I’ve used neither to replace the molasses. You’ll see how I’ve changed this and used another easy ingredient to incorporate that caramel kind of flavor here and it has worked beautifully. 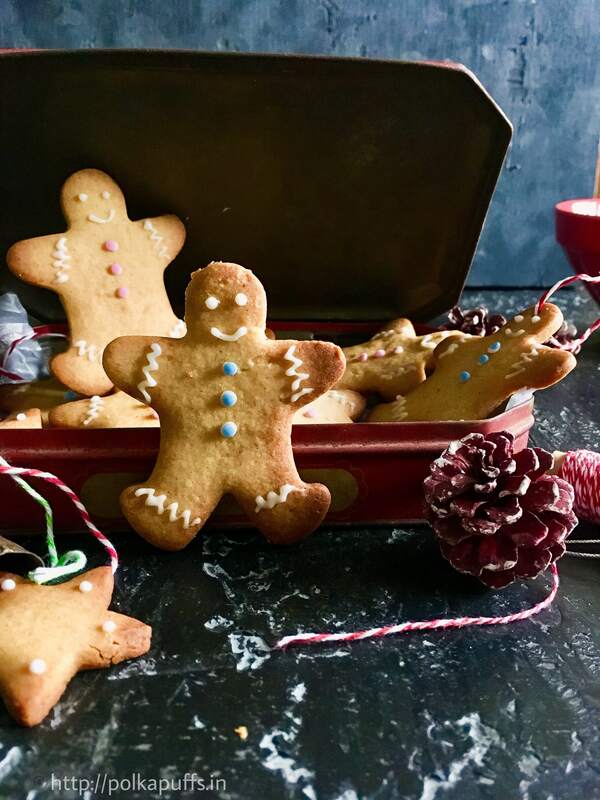 Since these are Healthy Gingerbread cookies (egg free), I’ve taken the risk of using whole-wheat flour here in this recipe. There was a chance that they would spread while baking but they didn’t spread at all! I kept an eye while they were baking and I was happy that they kept their shapes! I was worried that not adding molasses would cause the cookies to loose shape or probably they’ve bake unevenly. But, they are perfect. Bring all the ingredients at room temperature. The butter must be soft, not melted. 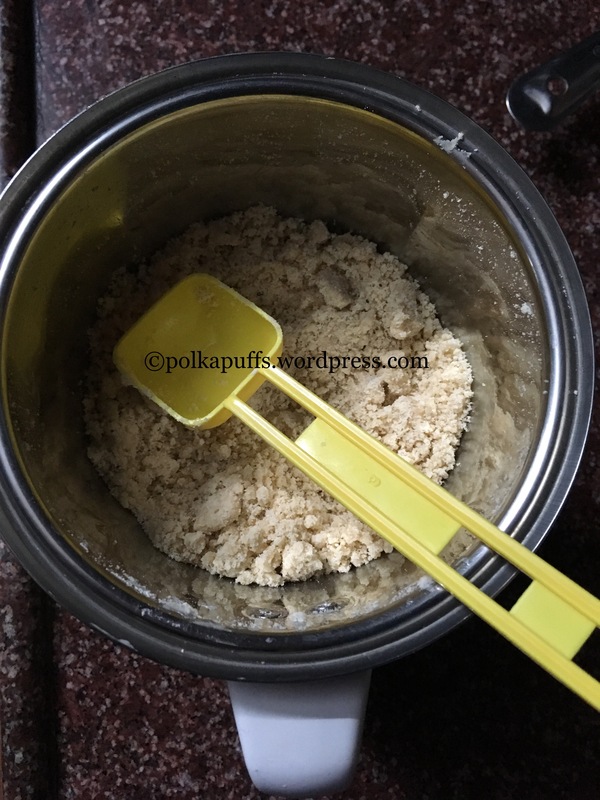 Take butter in a bowl, add powdered jaggery and brown sugar. Cream them but do not over do the creaming, the butter does not have to be light and fluffy. It just needs to be well incorporated with the jaggery and the brown sugar. If it’s over creamed then the cookies could spread as they bake. Next, add the golden syrup into the butter and sugar mixture. Mix them well but do not over beat them. 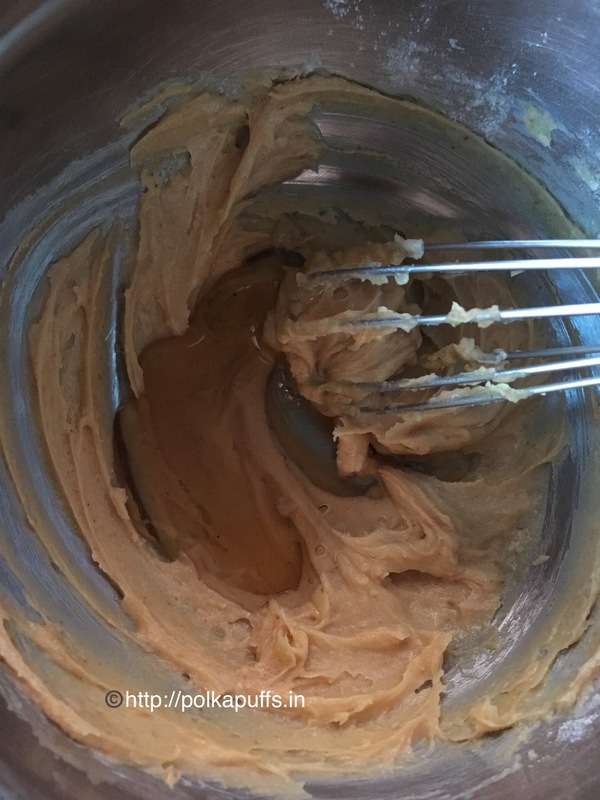 Add sifted whole wheat flour, baking powder, baking soda, ginger powder and cinnamon powder to the butter. Mix these well but do not beat them. Just use a rubber spatula to mix these together. Once everything comes together, shape the dough into a ball and wrap it in some cling wrap. Refrigerate the dough for 1-2 hours. Next, sprinkle some whole wheat flour on the kitchen platform or on a rolling mat, roll the dough to a thickness of 3-4 mm. 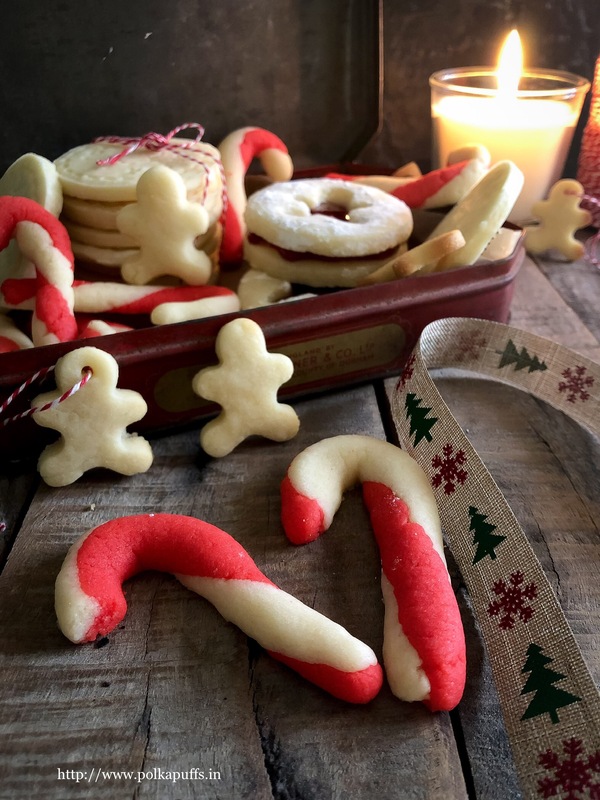 Use cookie cutters and cut out the cookies and place them on a parchment lined baking sheet. 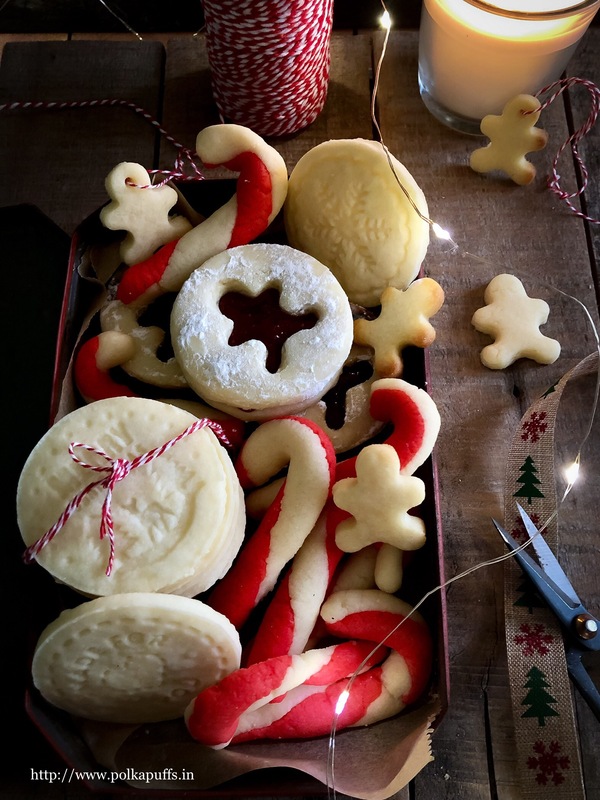 Refrigerate the cut out cookies for at least 30 minutes further so that they retain their shape as they bake. Preheat the oven @180’c for 10 minutes. Bake the cookies for 12-15 minutes or until the edges turn slightly brown. Remove the cookies from the oven and let them sit on the baking sheet for a few minutes as they crisp up. Transfer them onto a cooling rack to cool them completely. 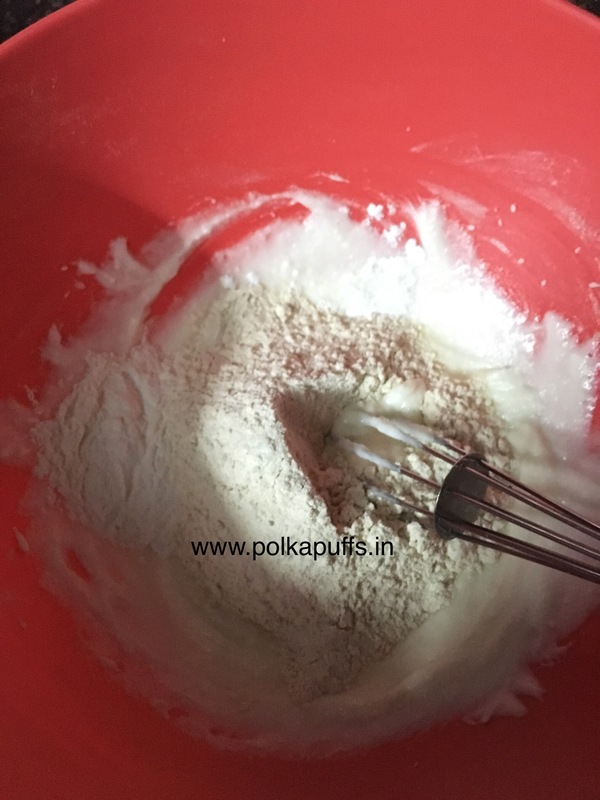 To prepare the egg free icing, mix together the icing sugar and milk. The consistency must be very thick and not free flowing. 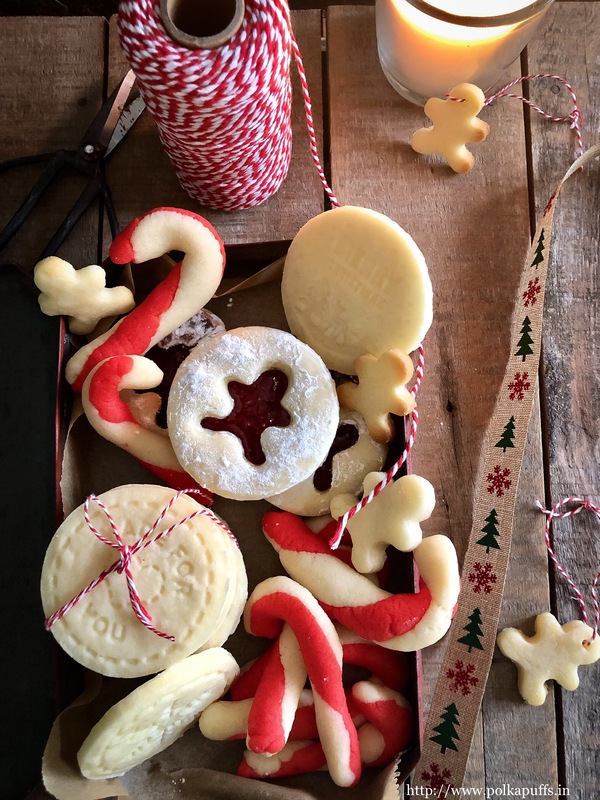 Fill the icing in a piping bag and decorate the cookies. Let the icing set for a minimum of 1 hour before storing the cookies in an airtight box. They stay fresh in an airtight box for 5-6 days. 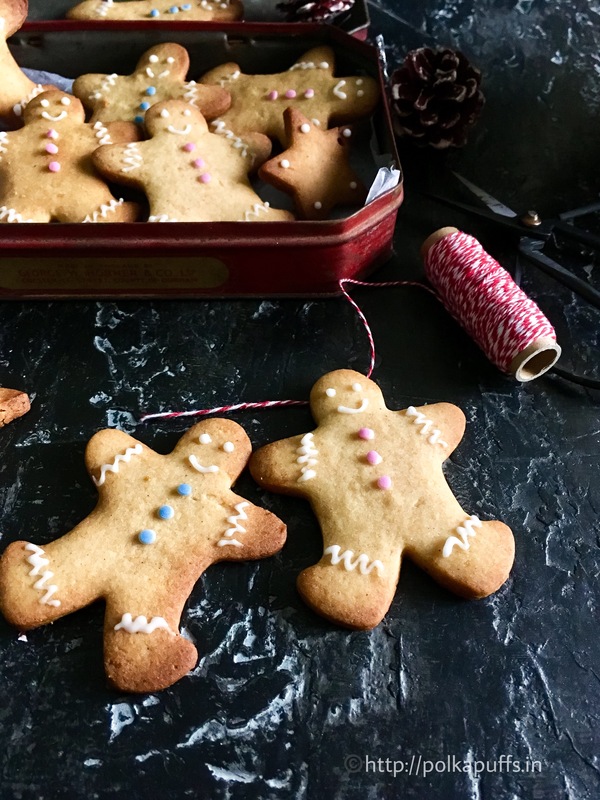 Christmas means plump, cute and delicious Gingerbread Cookies. These are made healthier with whole wheat flour which means more cookies!!! Cream them but do not over do the creaming, the butter does not have to be light and fluffy. 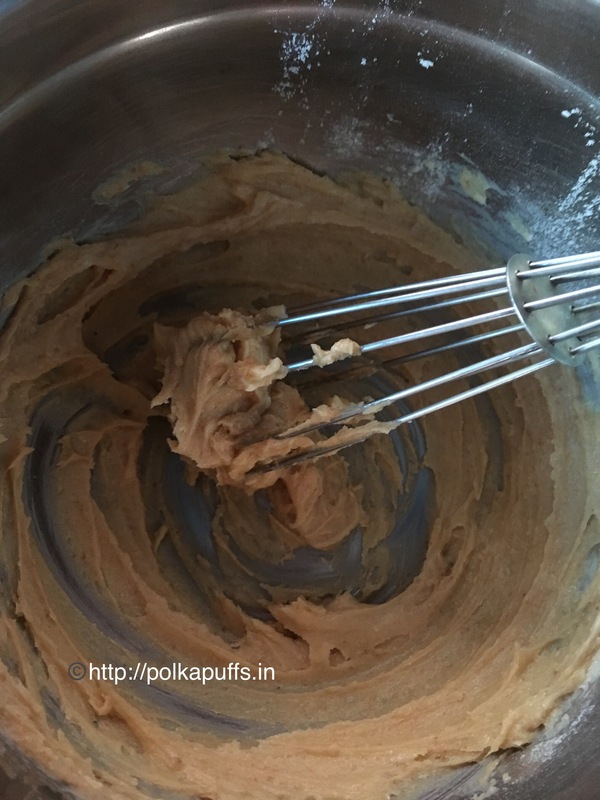 It just needs to be well incorporated with the jaggery and the brown sugar. If it's over creamed then the cookies could spread as they bake. Next, add the golden syrup into the butter and sugar mixture. Mix them well but do not over beat them. Preheat the oven @180'c for 10 minutes. Bake the cookies for 12-15 minutes or until the edges turn slightly brown. Mix together the icing sugar and milk. Use honey or molasses, if golden syrup is unavailable. But do not use blackstrap molasses as that will make the cookies slightly bitter. I have used golden syrup which is very thick, so using honey could change the texture of the dough a bit. Cute as a button, aren’t they?!! 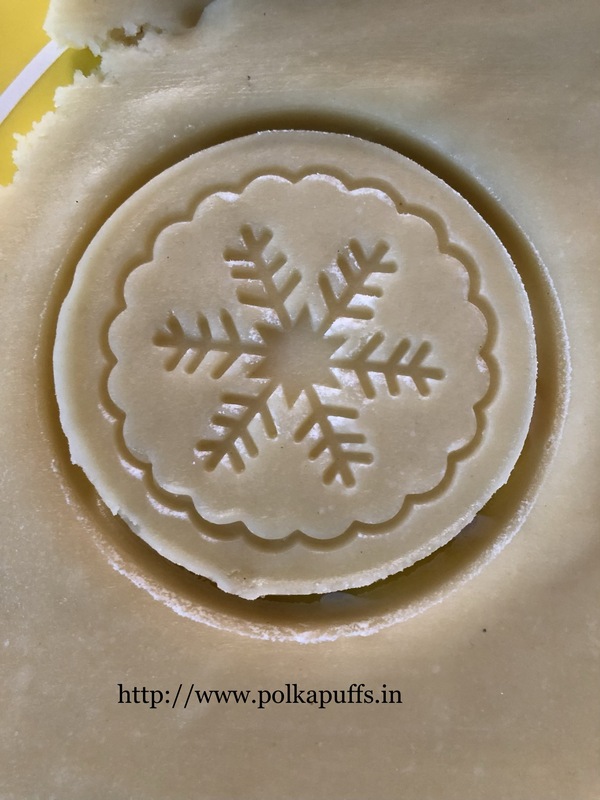 The baking bug has bitten me for quite sometime now and there days when I am baking around the clock! 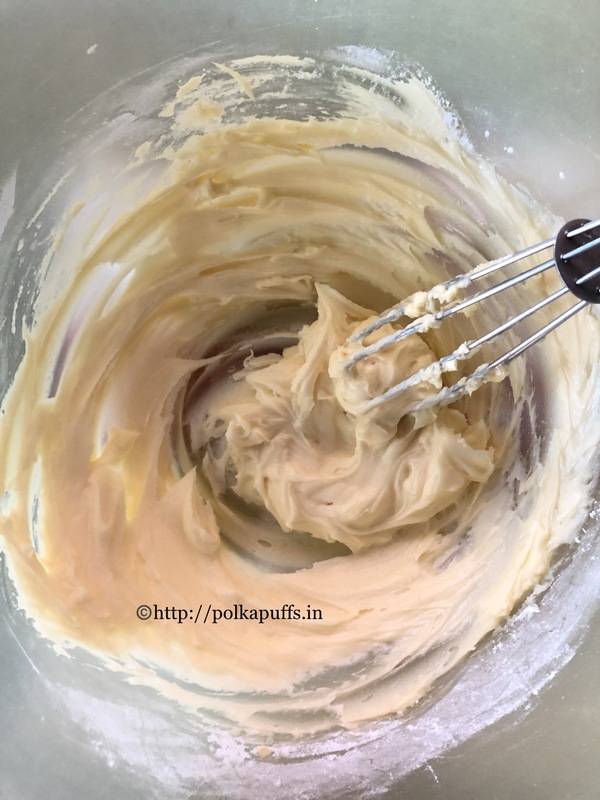 It’s fun to do so little and I still get to enjoy big treats😍😍…besides, baking all my meals sounds like a doable thing in these summers when standing in front of the stove is next to impossible! I bake things which my hubby and I both enjoy apart from experimenting new recipes or recipes which I’d bookmarked earlier….dinner last night was a batch of my Baked Spring Rolls which I served with some homemade Schezwan Sauce and glasses after glasses of my Tropical Iced Tea to cool things down 😁 I still have a bottle of the tea sitting chilled in the refrigerator for tonight….planning to pair it with my mixed lentil Adai and Tomato Chutney….mmmm! 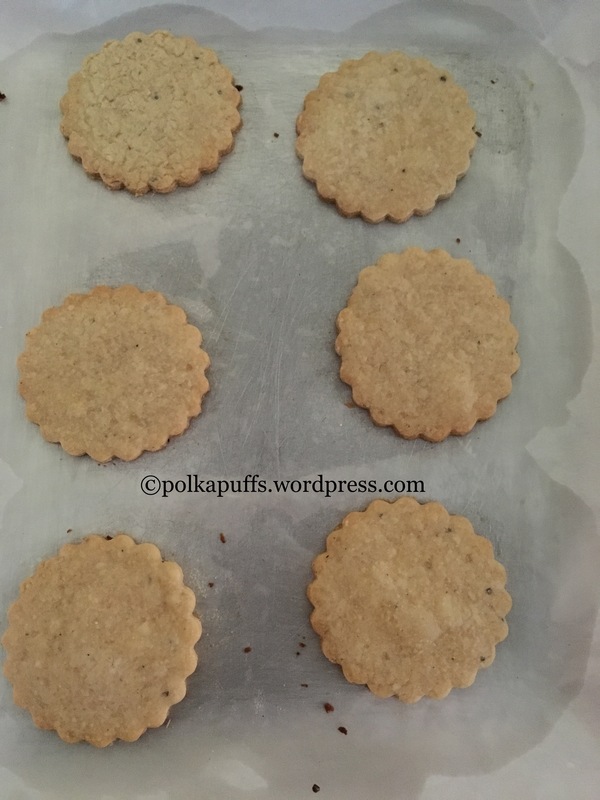 So while all this kept happening, my hubby reminds me about something I used to bake in the early days of my experiments with baking…almost over 2 years ago…he says why haven’t I revisited my Bakery Style Cumin Cookies a.k.a. 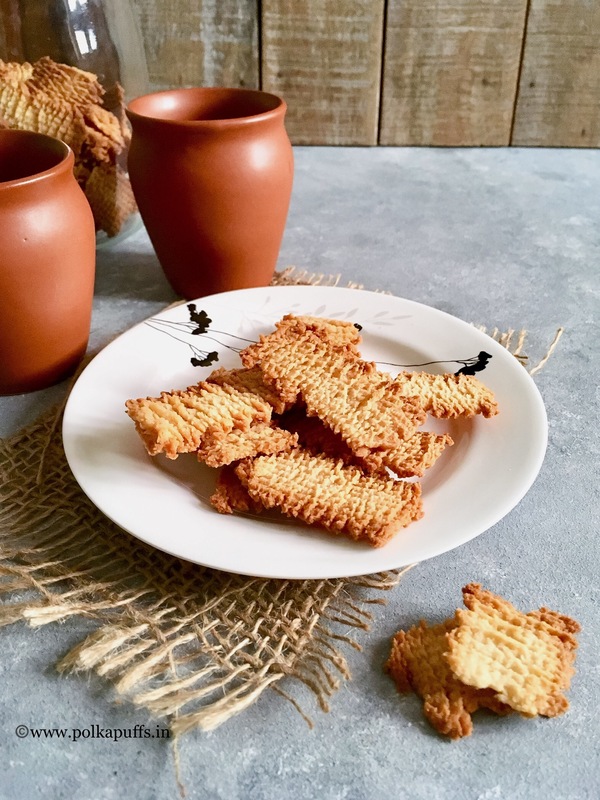 Jeera Biscuits! I was stumped 🤔…been over a year I made them for HIS teatime 😜😂😂 obviously, the poor chap must’ve been missing them! 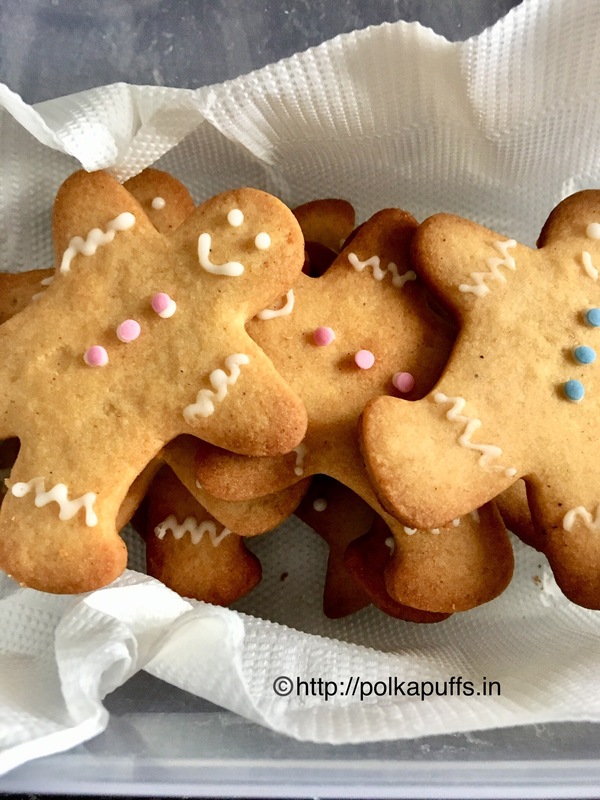 These bakery style cookies are so easy to put together, mildly sweet and tad bit salty..and the flavour of the roasted cumin seeds/ jeera seeds are something so earthy and yet addictive! Besides, they lend the crunch to them. 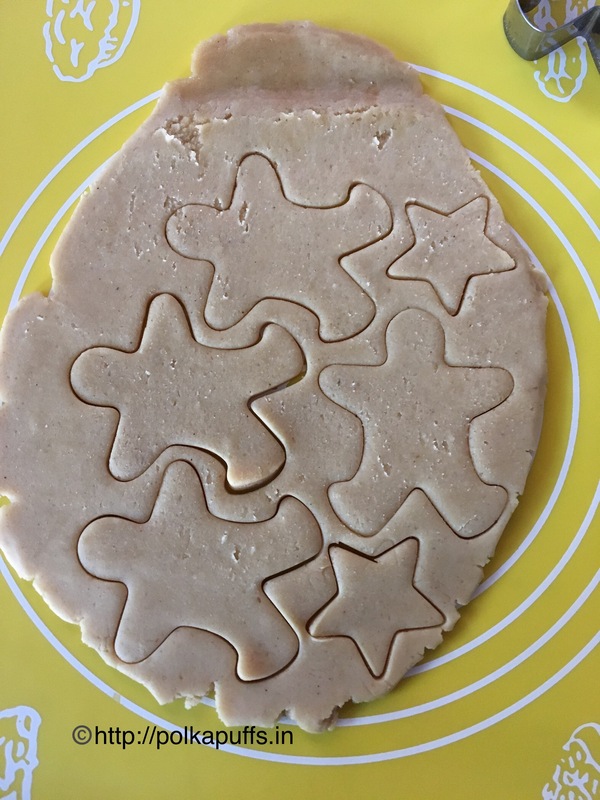 The original recipe which I had first used called for eggs but I have worked around to avoid eggs just as I avoid eggs in my Sugar Cookie recipe. Take cumin seeds in a pan and roast them until they are slightly brown and fragrant. Set them aside to cool. Line the baking trays with parchment paper/ butter paper. 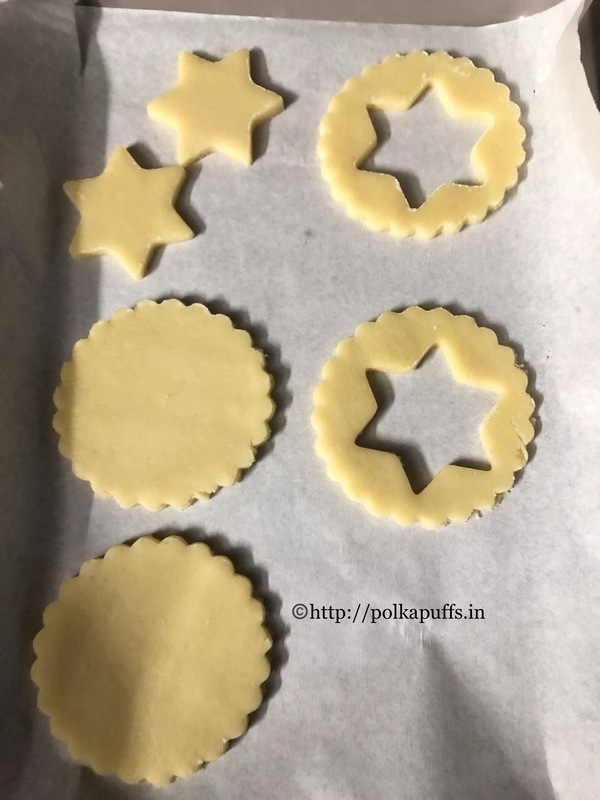 Lining the tray avoids having burnt bases and edges with the cookies and ensures they colour evenly even at the bottom and the cookies don’t spread too much. Now, in the mixing bowl, cream together the butter and icing sugar until they are smooth and well incorporated. Next, seive in the flour and add salt. 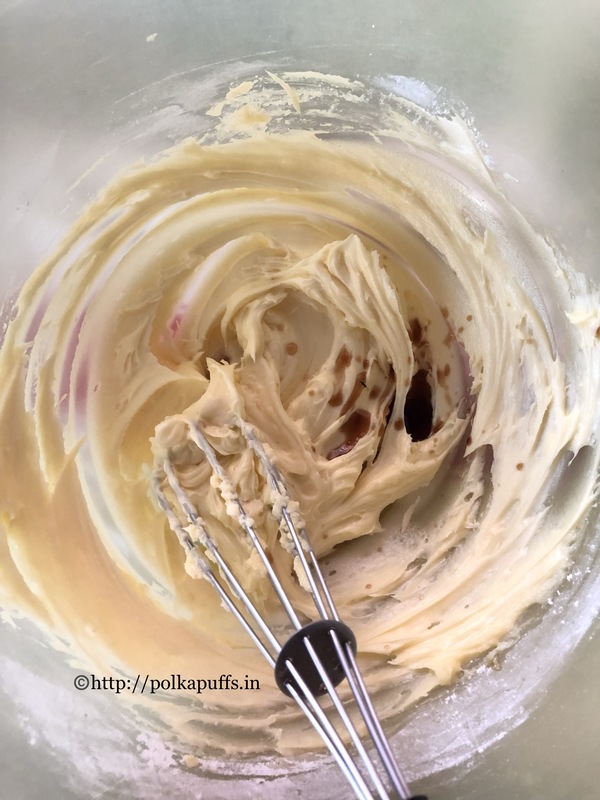 Whisk again until the flour is well incorporated into the creamed butter. Add baking powder and the 1 tbsp roasted cumin seeds. Make a smooth dough with your hands, you can add 1-2 tbsp milk if the dough needs some moisture to come together. It’s optional, I always add 2-3 tbsp. Smoothen the dough and set it aside for 10 mins. Next, dust your work surface (I prefer silicon mats) with some flour and roll the dough to a thickness of about 3mm and cut them in any desired size and shape. 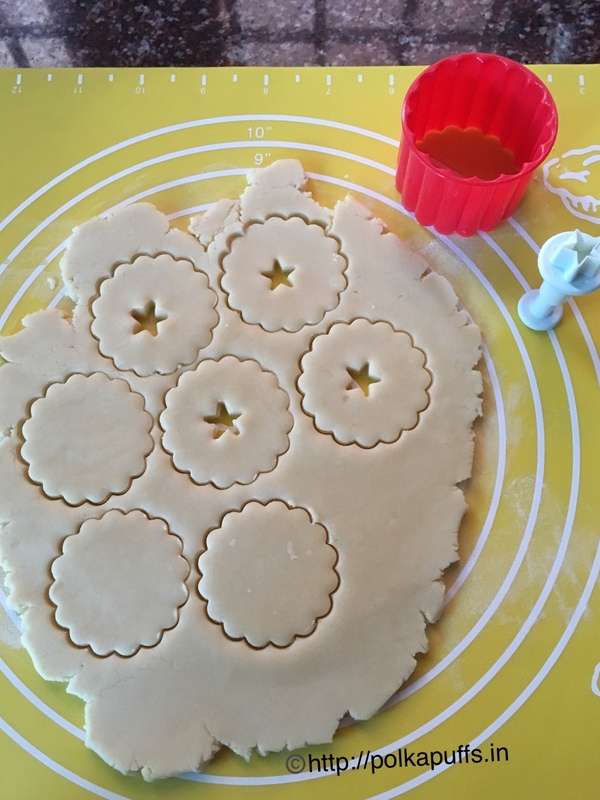 Place the cut out cookies an inch apart on the lined baking tray. Sprinkle some roasted cumin over each cookie. Place the baking tray with the cookies in the refrigerator for 10 mins to set the cookies before baking. In the meanwhile, preheat the oven @180’c for 10-12 minutes. Once baked, keep the tray on a cooling rack and let the cookies crisp up on the tray as they continue to cook for a few minutes on the hot tray. 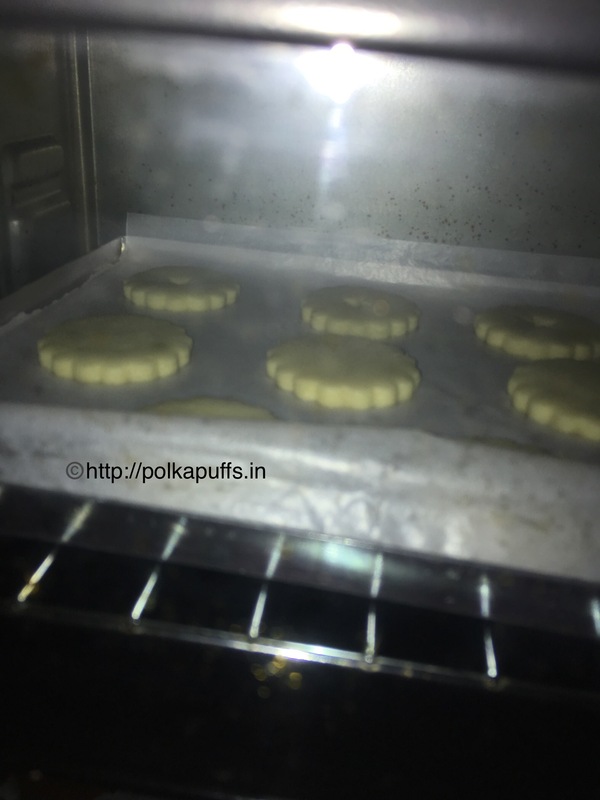 Remove them from the tray and place them on the cooling rack to let the cookies/ biscuits cool completely before storing in airtight boxes, they keep well for upto 3-4 days. 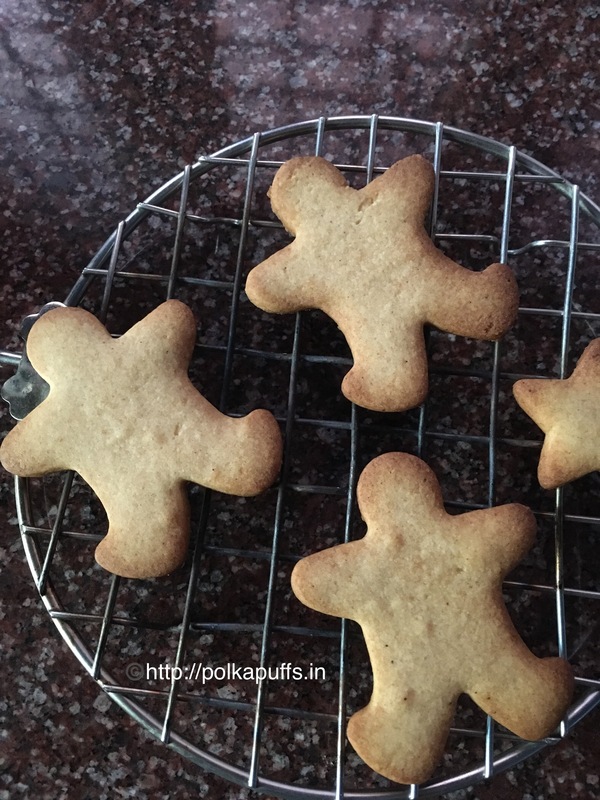 Bakery style Cumin Cookies a.k.a. 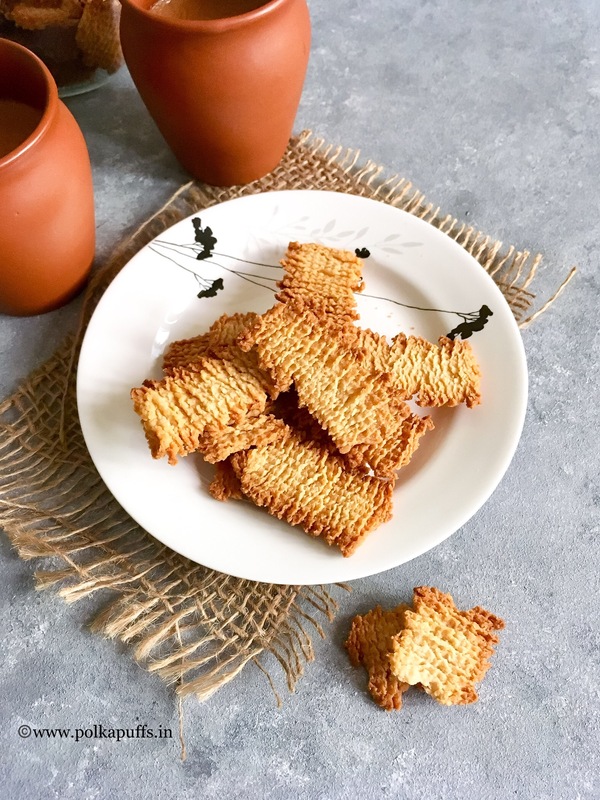 Jeera Biscuits for your tea time!! 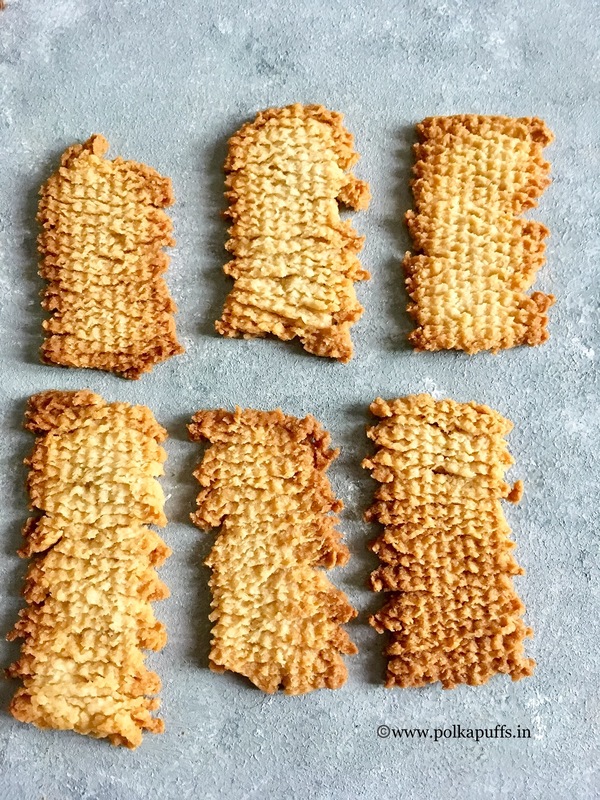 These cookies are egg-free and very crisp. 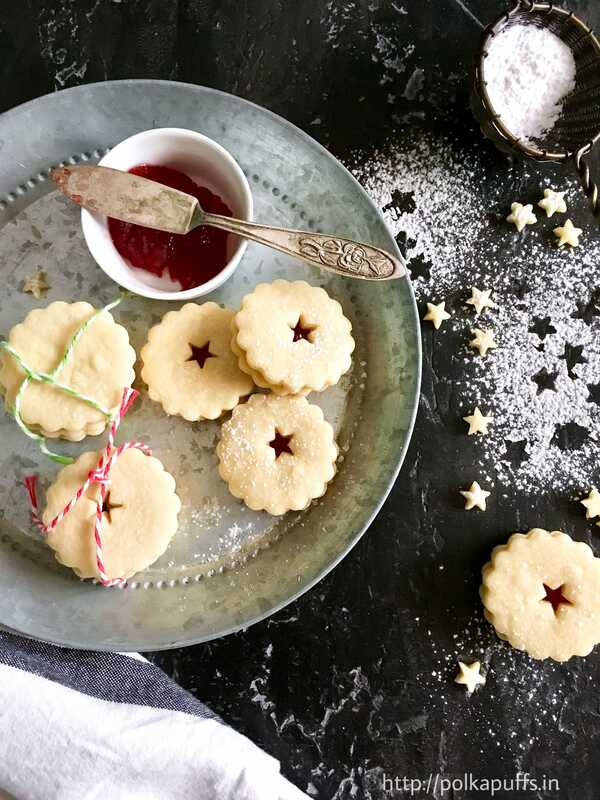 Just 30 minutes to a batch of these cookies! Line the baking trays with parchment paper/ butter paper. Lining the tray avoids having burnt bases and edges with the cookies and ensures they color evenly even at the bottom and the cookies don't spread too much. Next, sieve in the flour and add salt. 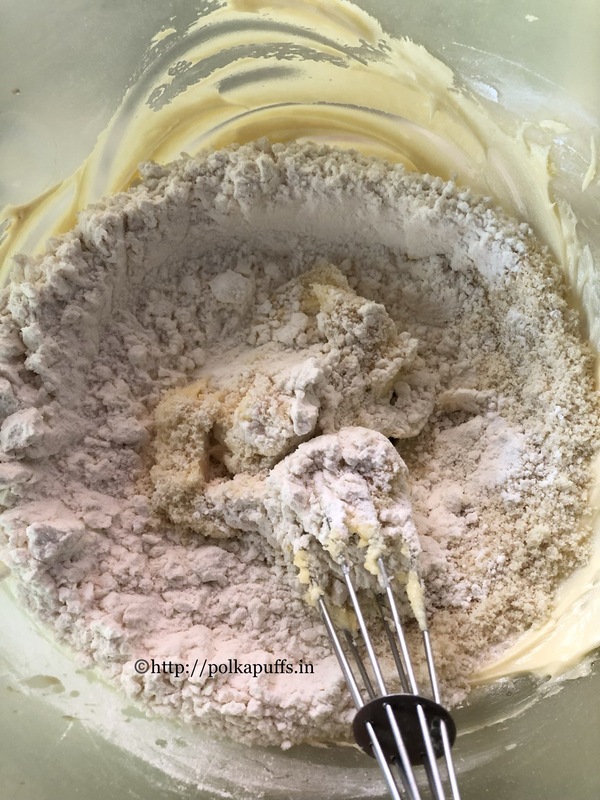 Whisk again until the flour is well incorporated into the creamed butter. 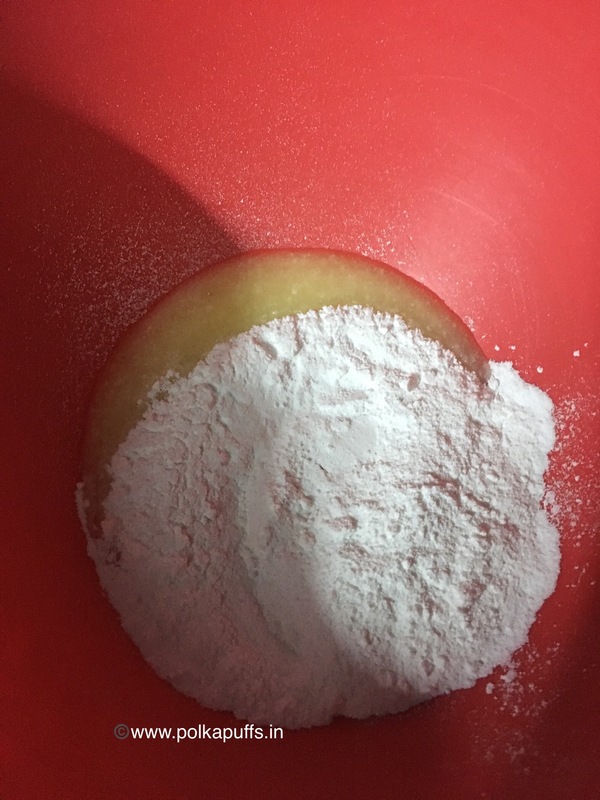 Add baking powder and the 1 tbsp. roasted cumin seeds. Make a smooth dough with your hands, you can add 1-2 tbsp. milk if the dough needs some moisture to come together. It's optional, I always add 2-3 tbsp. Smoothen the dough and set it aside for 10 minutes. 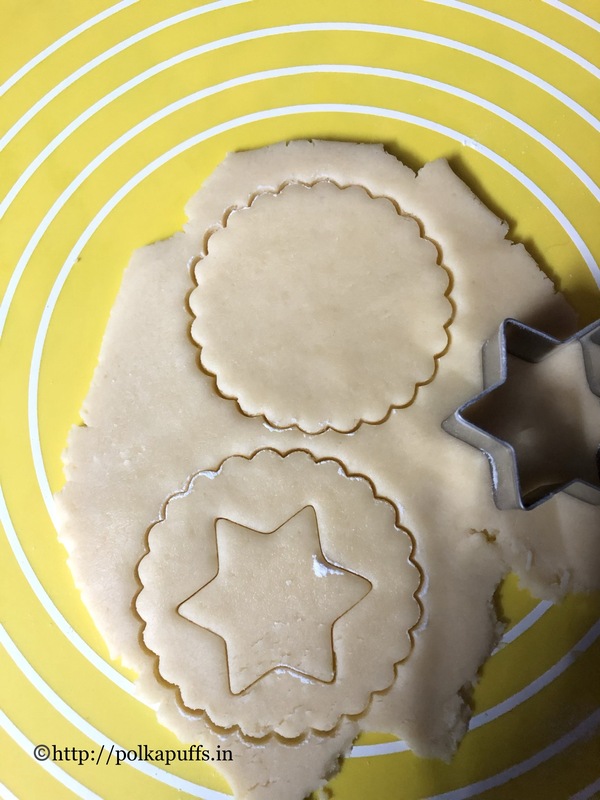 Place the cut out cookies an inch apart on the lined baking tray. Sprinkle some roasted cumin over each cookie. Place the baking tray with the cookies in the refrigerator for 10 minutes to set the cookies before baking. In the meanwhile, preheat the oven @180'c for 10-12 minutes. Once the cookies have set in the refrigerator, bake them @180'c for 12-13 minutes using both upper and the lower heating elements/ rods. They will turn slightly golden on the edges once ready. The base of the cookies should be a perfect golden brown. Once baked, keep the tray on a cooling rack and let the cookies crisp up on the tray as they continue to cook for a few minutes on the hot tray. 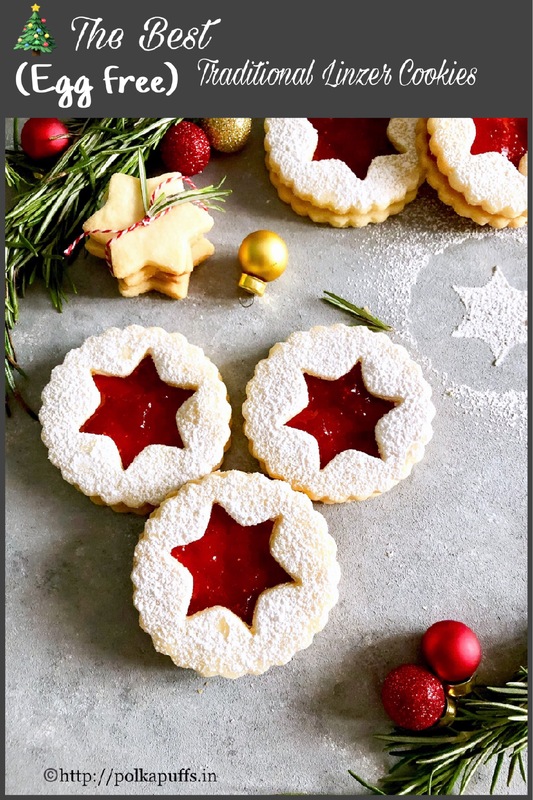 Remove them from the tray and place them on the cooling rack to let the cookies/ biscuits cool completely before storing them. Every oven works differently so adjust the baking time and temperature according to that. 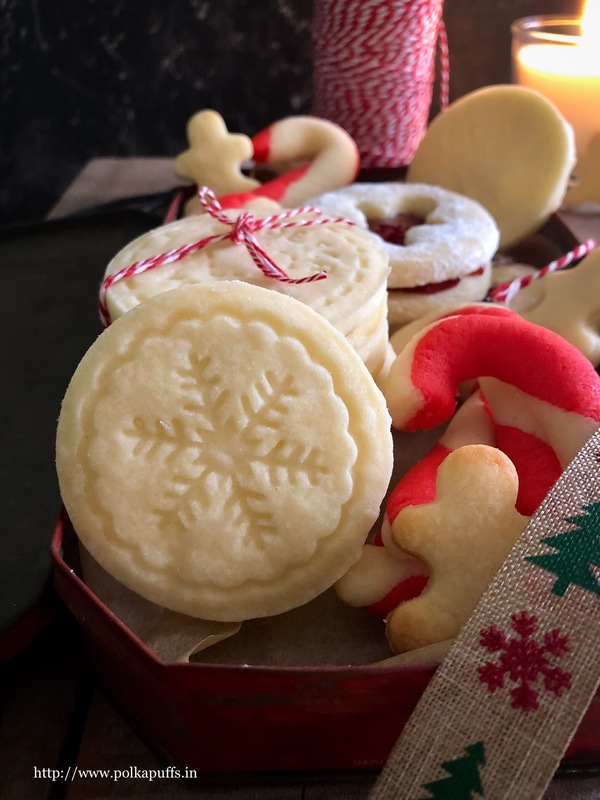 Store these cookies airtight boxes, they keep well for up to 3-4 days. You can add more sugar or salt, as per your choice. But be generous with the cumin! If you liked these, do try Rose and Pistachio Cookies. So….the oven has gotten enough time to cool down I guess😉 It’s been sitting idle since my spiced Orange and Cranberry Cake ….and that was one really good cake. 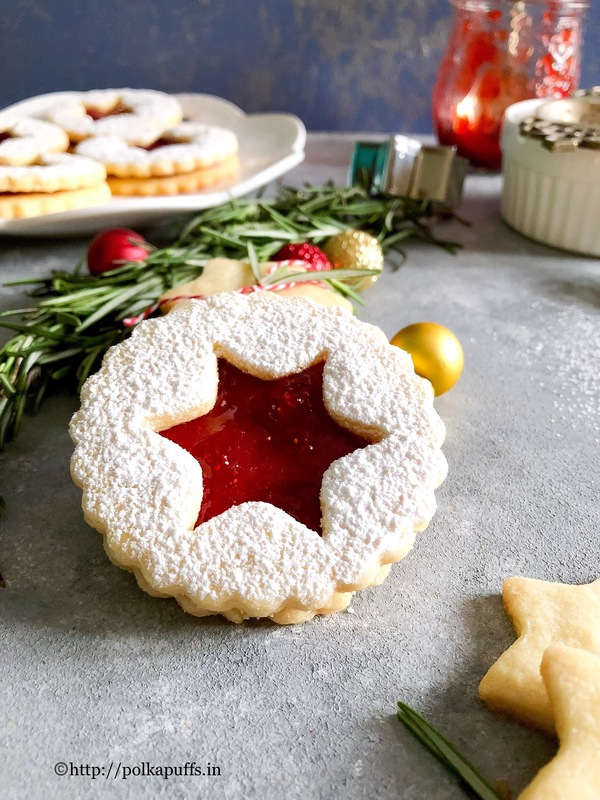 Besides, my hubby had been asking me for something to nibble at with his evening tea for almost a week…and I kept putting it off…I am kinda on the slow mode…the climate has made me a bit lazy and I barely do much cooking these days…just the basic stuff and that’s about it! Why these cookies? Oats✔️ Wholewheat ✔️ eggs ✖️ easy and quick ✔️ so many reasons to stick with this recipe! Don’t these look pretty?! The thing is…they need not be pretty at all. 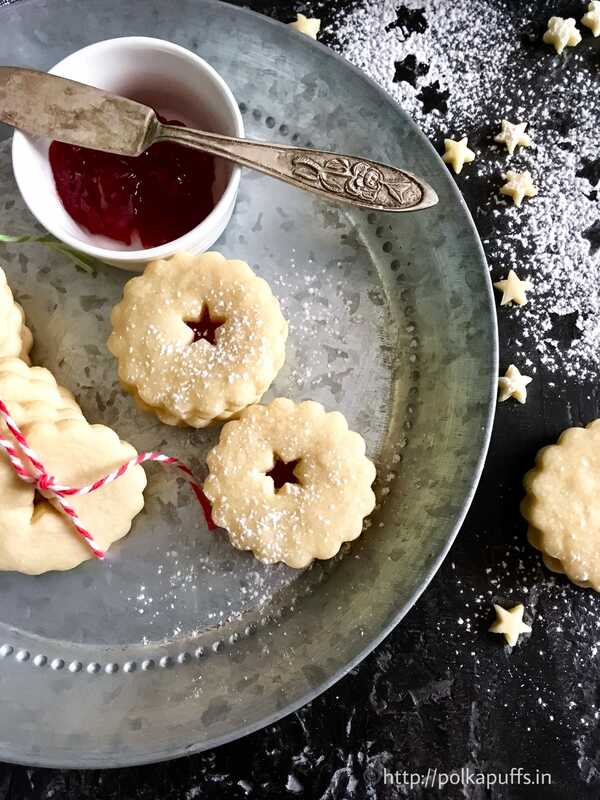 You can keep them as simple, plain cookies sans the filling. But I like everything pretty….so I went ahead and added a touch of gorgeousness. I have given them the classic scalloped edge shape and filled them a light and flavoursome lemon icing. We loved them! This is the first time I went ahead with an icing for these cookies. Obviously, you can go for any other flavour here, some butterscotch essence or some good quality vanilla extract, these are the classics and taste absolutely great with tea or coffee. These cookies are extremely crispy and have the most beautiful crumb. 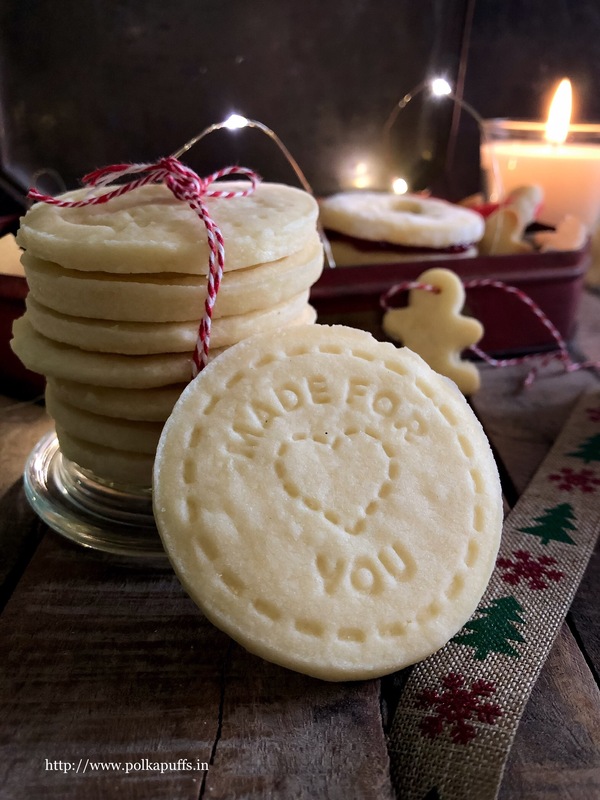 Being mildly sweet, the flavour of peppercorns and sea salt in the cookies comes through in every bite and the lemon icing adds freshness. Yes, this recipe has freshly cracked black peppercorns and some sea salt too. Why easy from there? Reason – this recipe needs precision. I have used a weighing scale but you can always google the ‘gram to cup’ measures easily. The original recipe called for Maida or APF but I have been replacing it with wholewheat flour for the last few times that I’ve made it. Seemed to work fine. However, feel free to use APF instead in equal measures as the wholewheat flour, the results will remain the same – excellent! 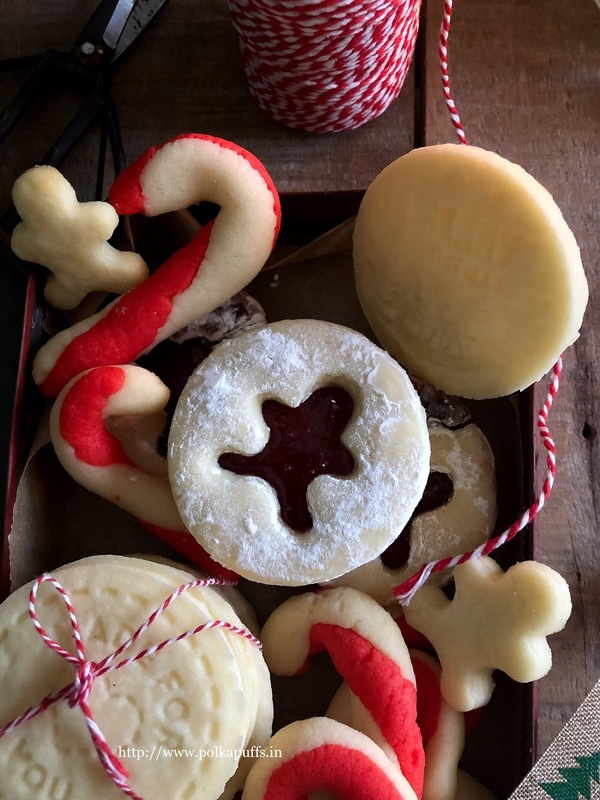 Equipment: a blender, a rolling pin, weighing scale, measuring cups/ spoons, rolling board, cling wrap, cookie cutter, baking tray, parchment paper, cooling rack, a small bowl, a spoon. Spread the oats on the baking tray. Let the oats turns golden in the oven @160’c for about 5-7 mins using only the lower heating rods/ coil. Remove the oats from the oven and cool it at room temperature. Once cooled, grind the oats to a fine powder. Now seive the wholewheat 2-3 times. In a blender jar, add the powdered oats, seived wholewheat flour, butter, sea salt, freshly cracked black peppercorns, light brown sugar and the confectioners sugar. Pulse everything together for a couple of minutes. The mixture should resemble bread crumbs. Next, add 1 tbsp of chilled water and pulse again. 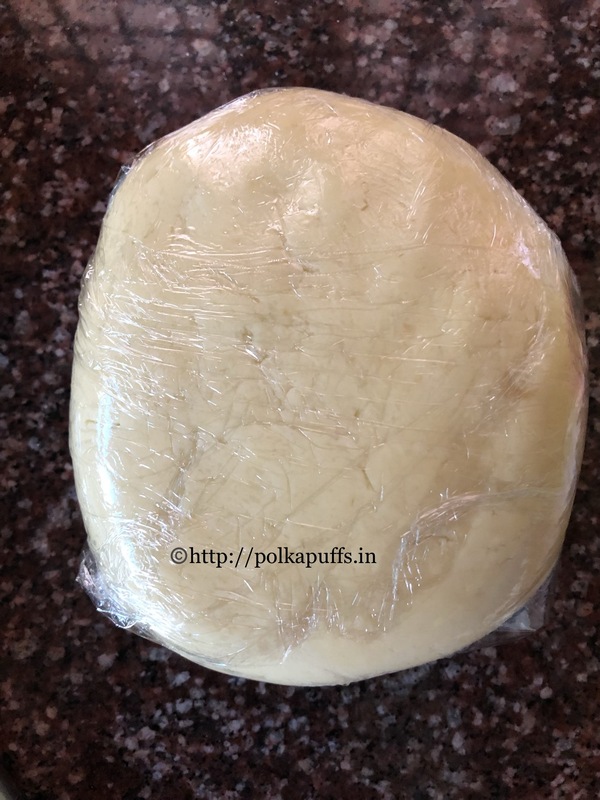 If the dough begins to look like it has come together, remove it on a bit of cling wrap and make a ball and cover it well with the cling wrap. If the dough hasn’t come together, then add about 1/2 tbsp more of chilled water at the most to make the dough to come together. Don’t add too much water else there will be no going back from there. 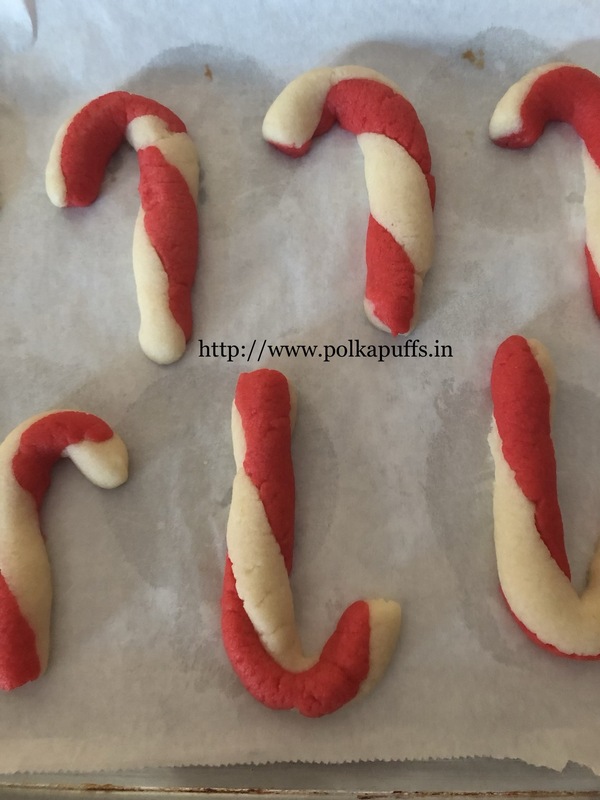 Let the dough chill in the refrigerator for about 1 hour minimum or even upto 24 hours maximum before rolling and cutting the cookies. (I refrigerated the dough for about 30 hours as I had some other things to do before getting back to these cookies). Line the baking tray with parchment paper. Preheat the oven @180’c. 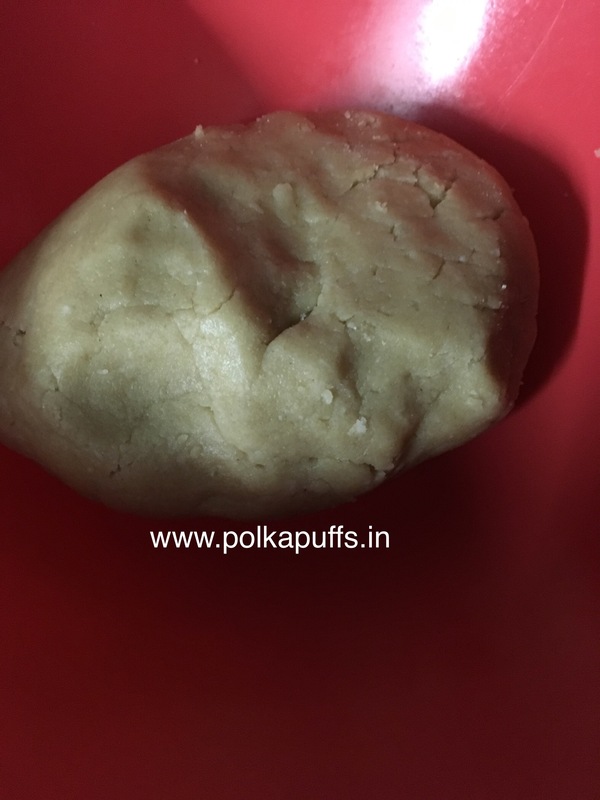 Once the dough has chilled for about an hour, let the dough thaw at room temperature for 10 mins. Dust the rolling board and the pin with some wholewheat flour. Roll the the dough to a thickness of about 3-4 mm. 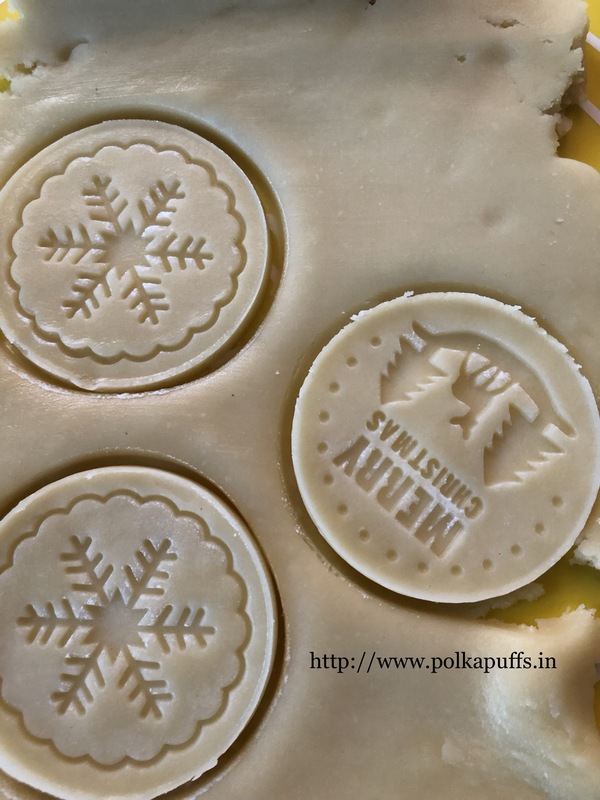 Cut the desired shapes and place them on the parchment lined baking tray about an inch apart. 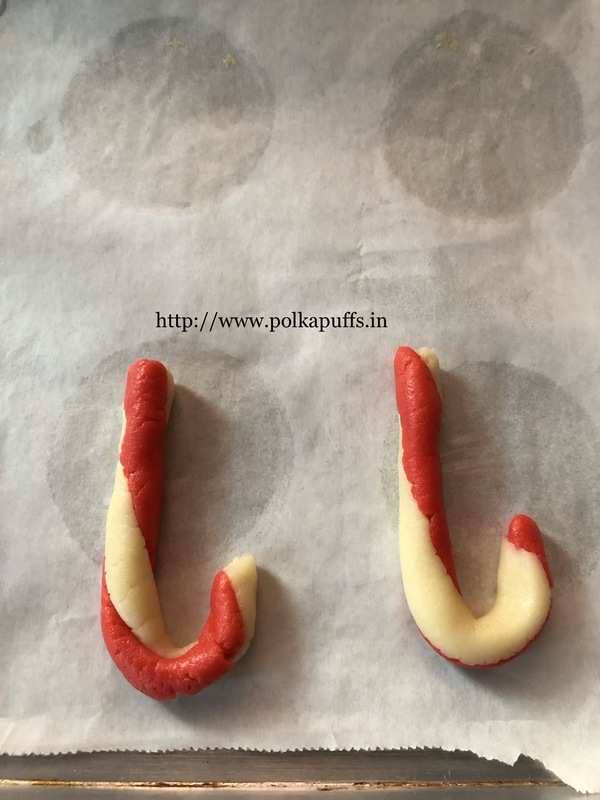 Chill the cut out cookies for 15 mins in the refrigerator. Chilling the cut out cookies makes sure the cookies never spread much. 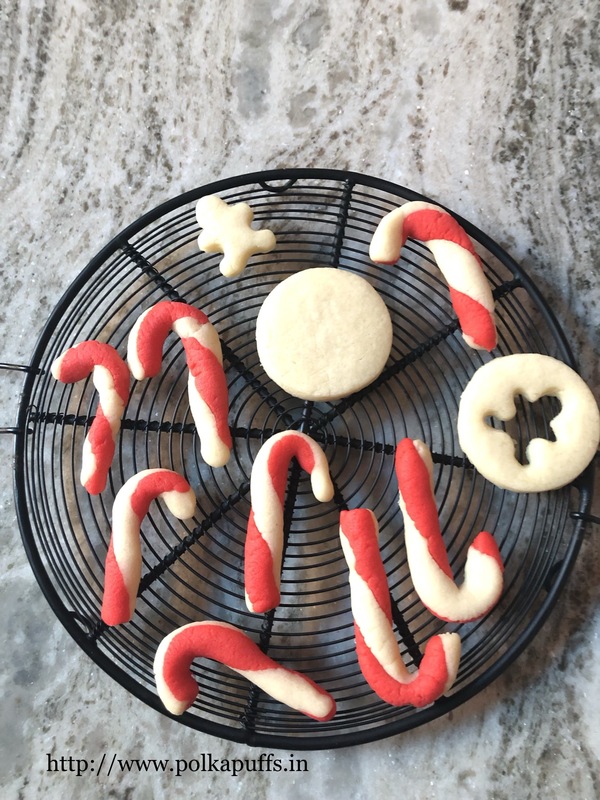 Let the cookies cool down completely in the cooling rack. Mix all the ingredients together to make a thick icing. Spread a bit of icing on the underside of one cookie and place the other cookie over it to make a sandwich. Do the same with the rest of the cookies. 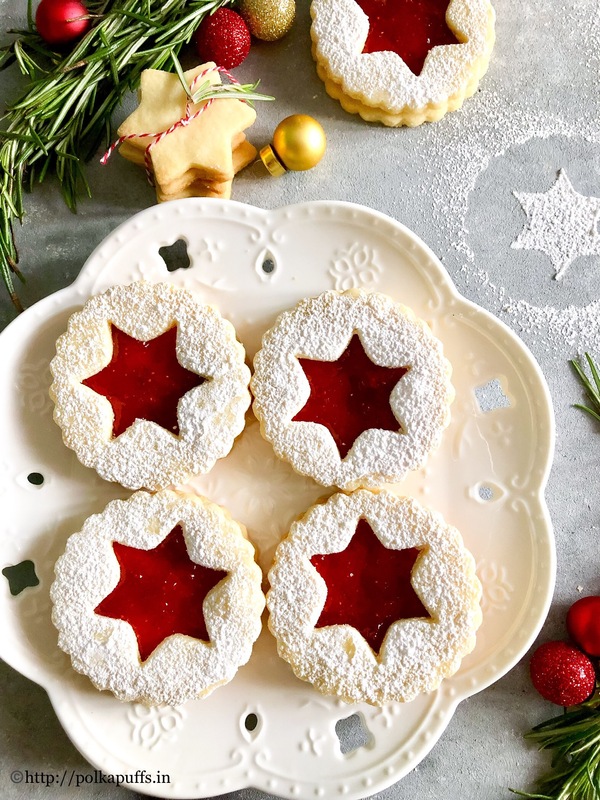 These Sandwich cookies keep well for 3-4 days in an airtight box. They keep well for over a week without the icing in an airtight box. Store bought cookies are not his kind…he finds them too sweet and the Maida (all purpose flour) makes it way too heavy. I agree…these are precisely the reasons why even I don’t like indulging in them too often. 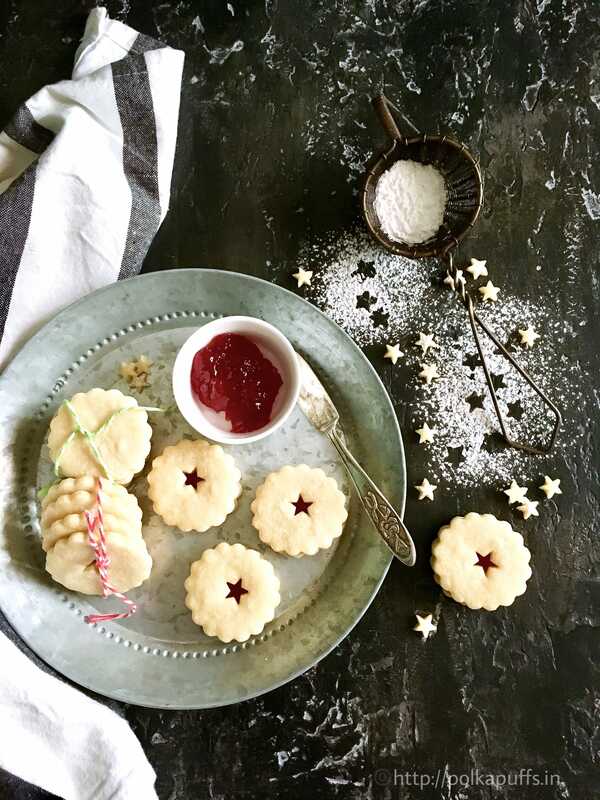 Also, these cookies or biscuits are often made with Dalda (vegetable fat) which isn’t the healthiest choice. Though they are very crisp but definitely not our choice. But you learn..make your own mistakes and then understand where you went wrong. I referred to so many recipes all over the place just to make a good wholewheat cookie. 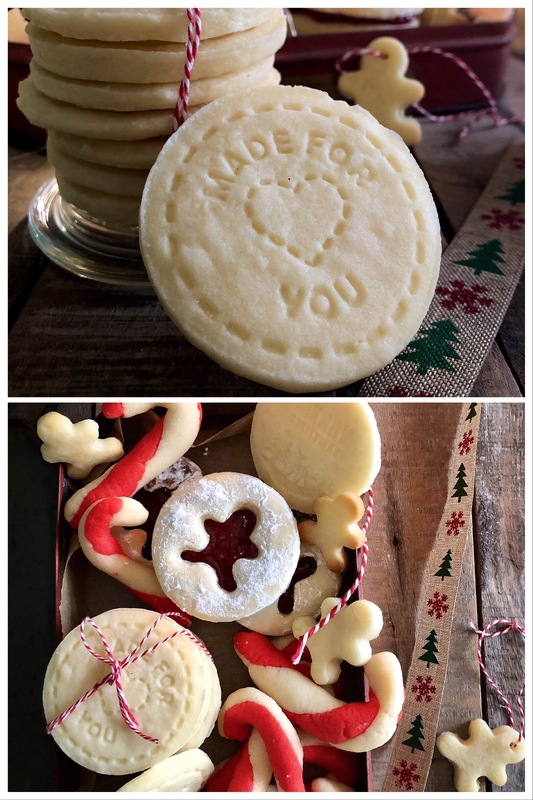 Finally, almost over a year ago I was able to stick to a recipe where I was happy with each aspect of the result…. It was crisp, perfectly cooked and did not spread much. Just the way I wanted. 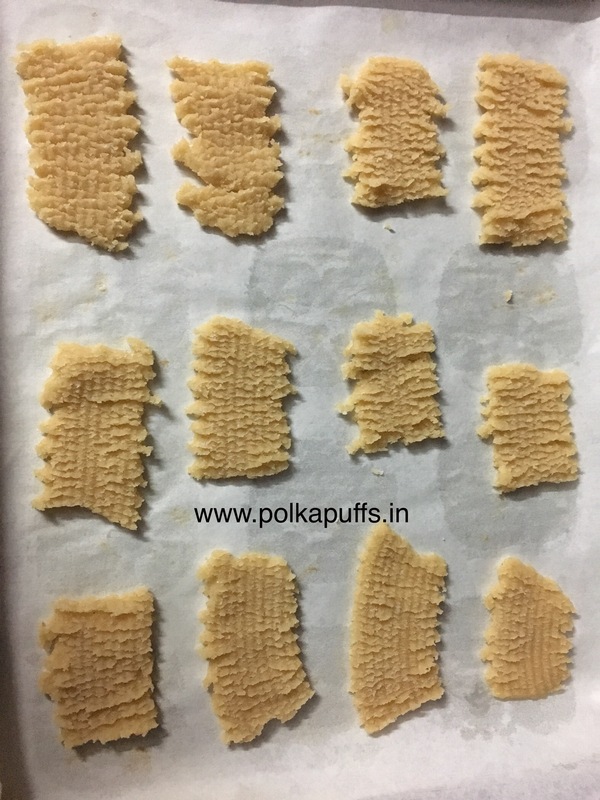 I am going to share a few tips here that I learnt in the process of learning to bake these atta cookies ..
* the very first trial with making these atta cookies was inspired by a recipe I saw in some magazine at my Mom’s place. It had used butter obviously, but I used oil to make it healthy. The result was a congealed mass on the tray even after baking for 25 mins. It simply spread. * next, after a few hits and misses, I tried them using ghee (clarified butter). They tasted decent but felt a little heavy for our palates. They were crisp but became soggy on the second day. They too spread but not too much. Not satisfactory. Hope you have gone through the tips above before we begin the actual recipe. 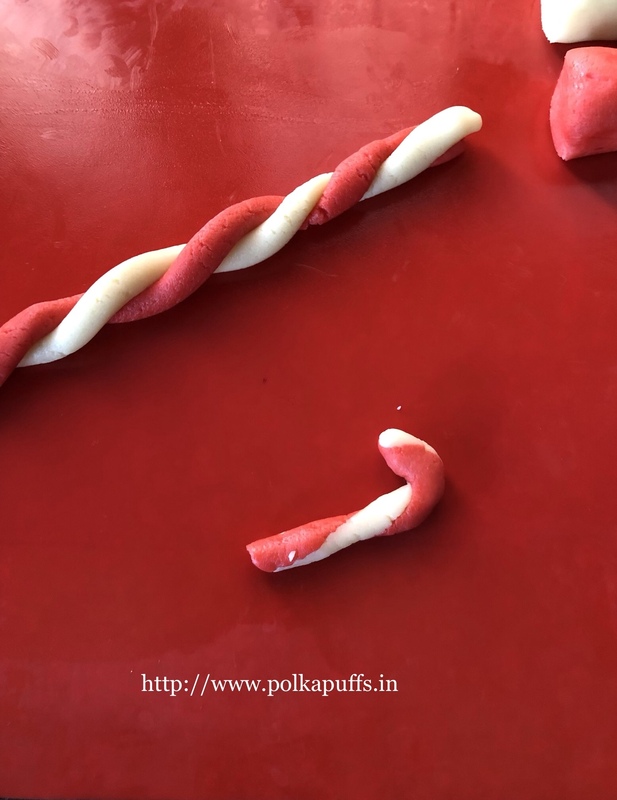 Equipment: (no fancy equipment is ever used for this, remember I was learning to bake with basic things at home) a wired whisk, a large mixing bowl, a small bowl, baking tray, parchment paper/ baking paper, a cooling rack, measuring cups/ spoons, as small pan, a weighing scale if you have one would be excellent. 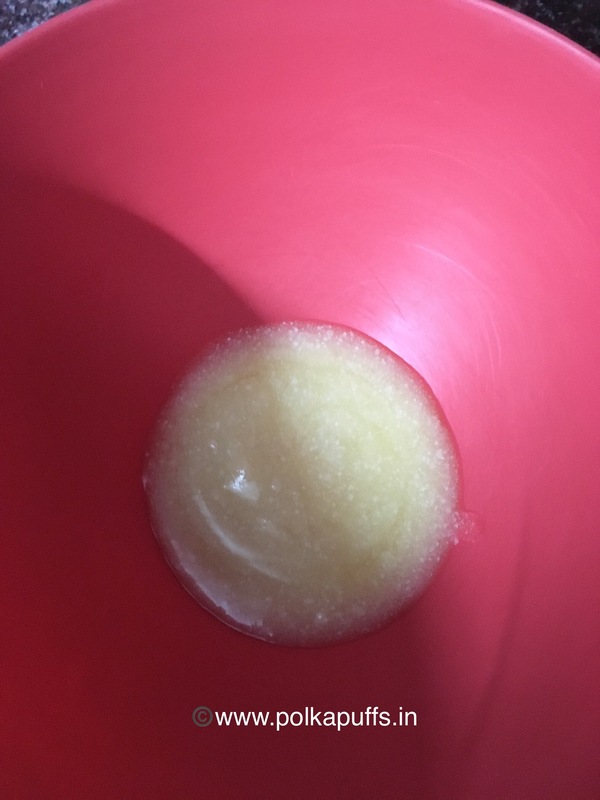 How to measure the atta – fill the cup with spoonfuls of atta. 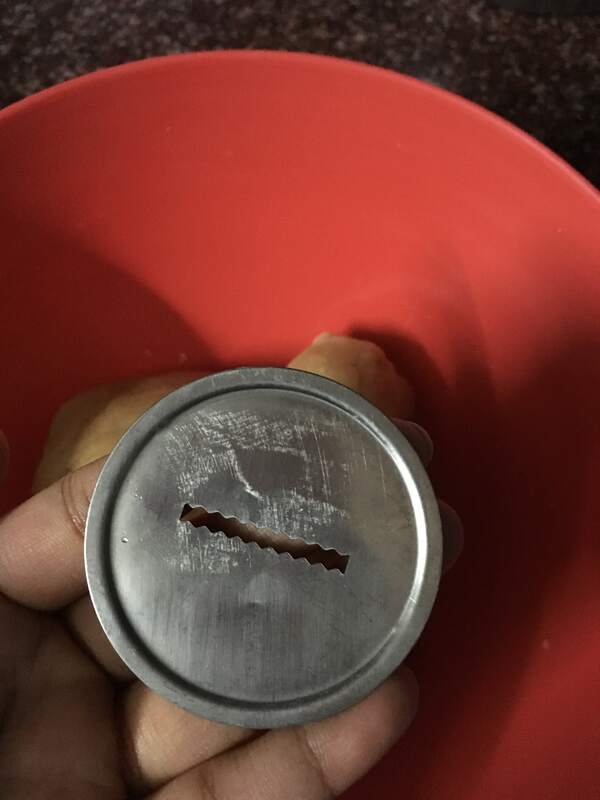 Do not dip the cup into the container with the atta. That way you will always end up with extra atta and the ratio will be wrong. Seive the atta along with the baking soda once. Set it aside. Take butter in the pan. Let it melt on very low flame. Once it’s melted, let it cool for 2 mins. Take the butter in a small bowl, then add the powdered sugar and cardamom pwd in the butter. 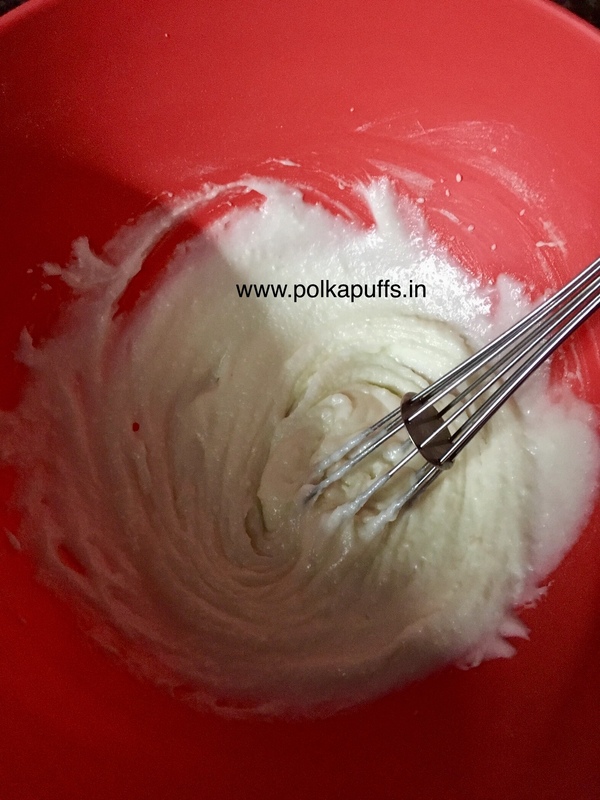 Whisk well to make a smooth mixture. Now add this mixture to the sieved atta and baking pwd. Mix it gently and bring it together. This is not like Roti dough so it with crumbly. Let the dough rest for 5-7 mins to absorb the butter. Then gently shape the cookies (takes me 20 mins for just 12 cookies each time). 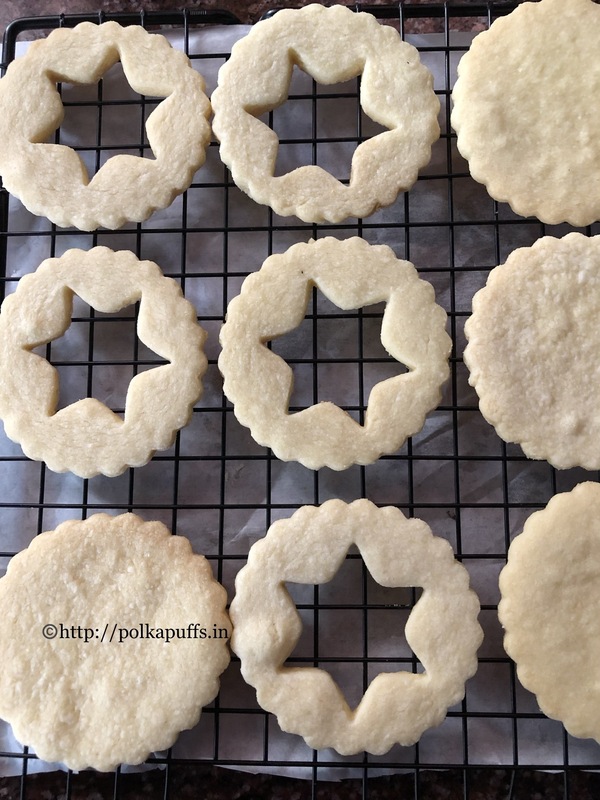 Make sure the shape of cookies is evenly sized and smooth all over. (See the pic above). 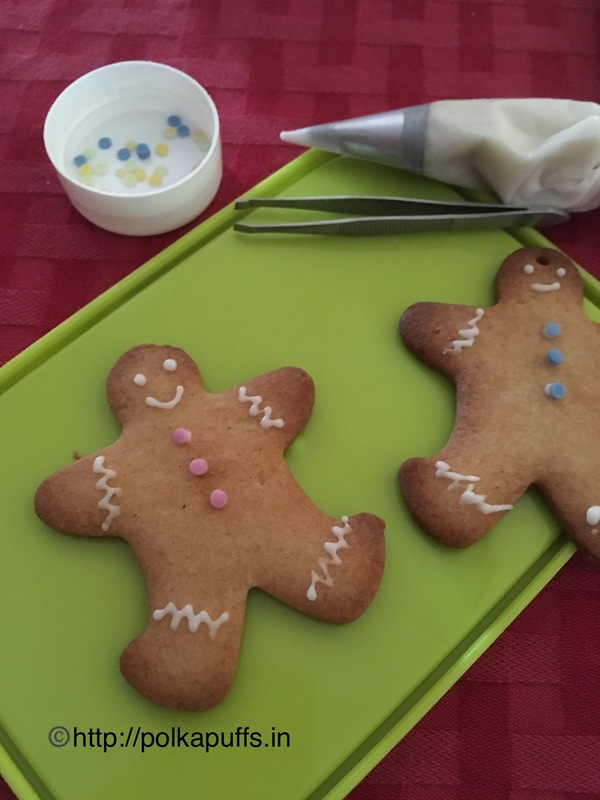 Place them apart on parchment lined baking tray. I can make 12 cookies with this quantity, you may have 10 or 14 as well, depending on the size. 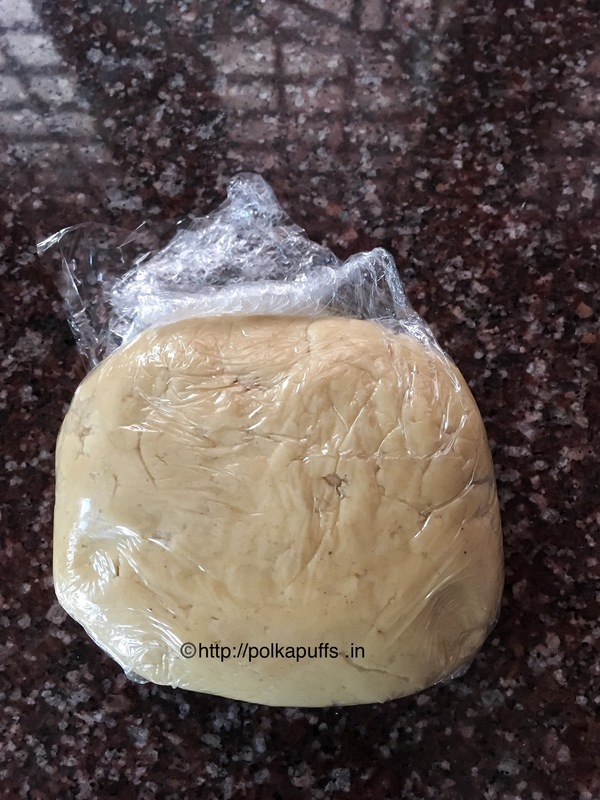 Once you have shaped the dough, keep them in the refrigerator for 15 mins. Preheat the oven at 150’c for 10 mins. (Every oven is different so work according to that for setting the temperature and duration for baking). Take the baking tray out from the refrigerator and place it in the middle of the oven to bake at 150’c for 20-22 mins. They will turn golden on the top and slightly brown at the bottom. Do not bake at high temperatures else the cookies with burn at the base. Once the cookies are baked, keep the baking tray out of the oven for 10 mins on a cooling rack. Then transfer the cookies to the cooling rack for cooling them completely. They are soft at first then turn crisp as they cool. Once completely cooled, store them in airtight box. Occasionally, I do like a cup of lemon tea with these cookies! Also, try sugar cookies by me. 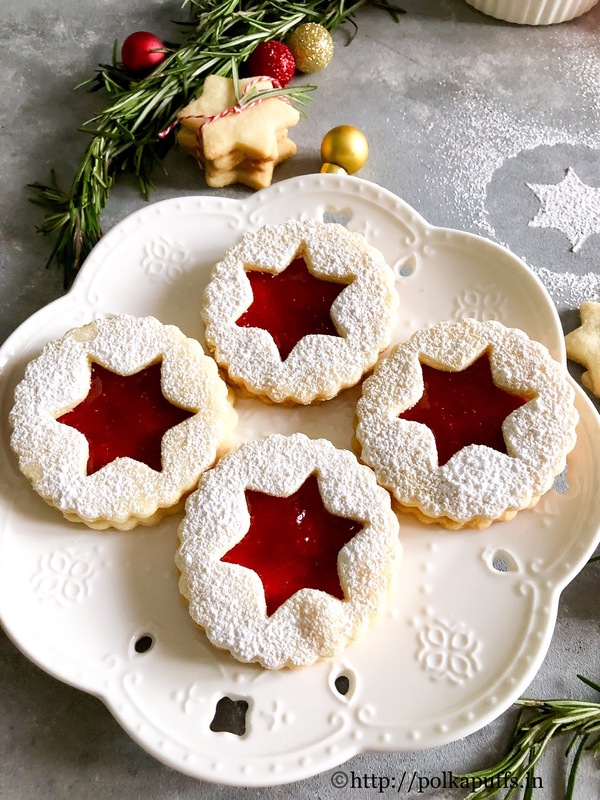 Today seems like such a cookie kinda day to me…all I want to do is grab a good book, some cookies and curl up on the couch! But I won’t, because I am a nice person (😉) and I chose to share a delicious recipe with you guys!! My suggestion – bake a smaller batch, they taste great when fresh. 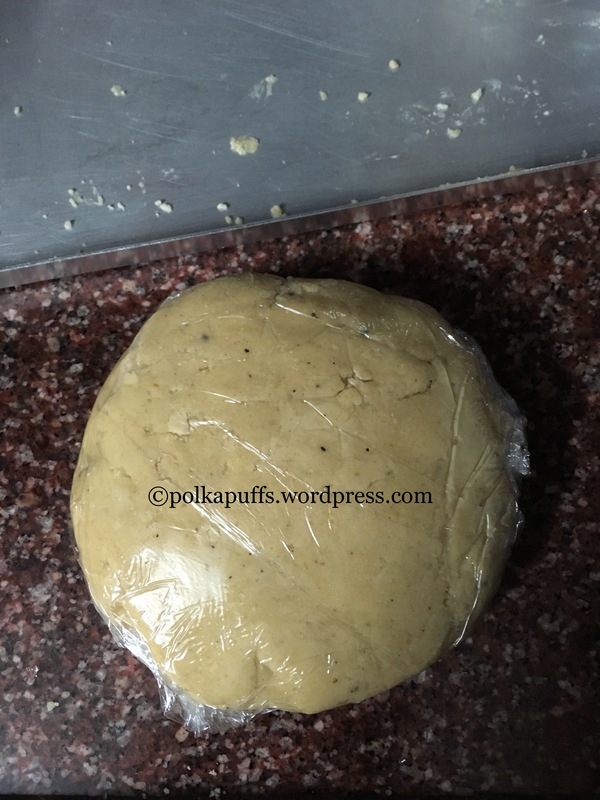 Also, you can freeze the dough for upto a week. Portion them before freezing, spread the portioned dough on a plate and freeze. Once frozen, store them in ziplock bags. 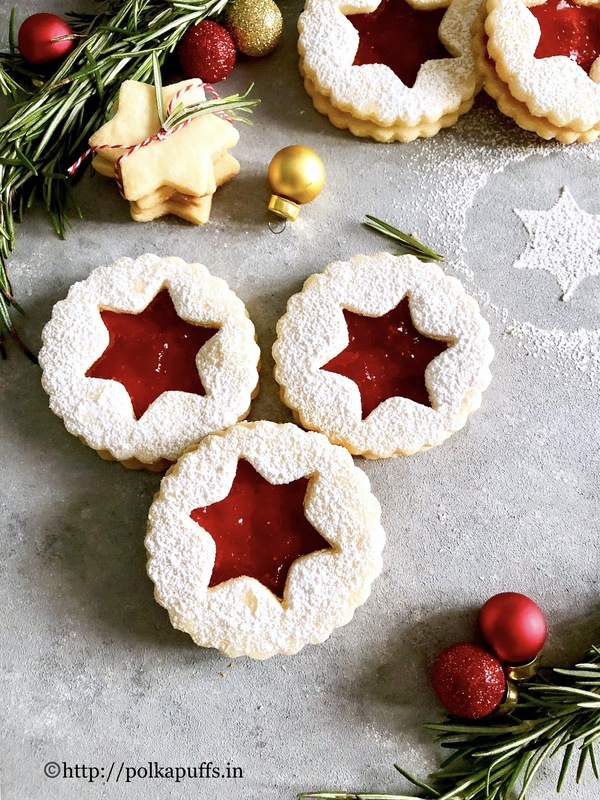 Later, thaw the number of cookies you want to bake at room temperature for about and hour or until they come to room temperature, then pop them in the refrigerator for 15 mins to set a bit else they will spread too much while baking. Bake them as per the instructions given below. Equipment: measuring cups/ spoons, baking tray, mixing bowl, fork, parchment paper, a whisk/ electric whisk, cooling rack. Next, add the flour, Choco chips & baking soda. Fold them in gently. Lastly add the peanut butter and fold again. The dough is ready, rest it in the refrigerator for an hour to set the dough. 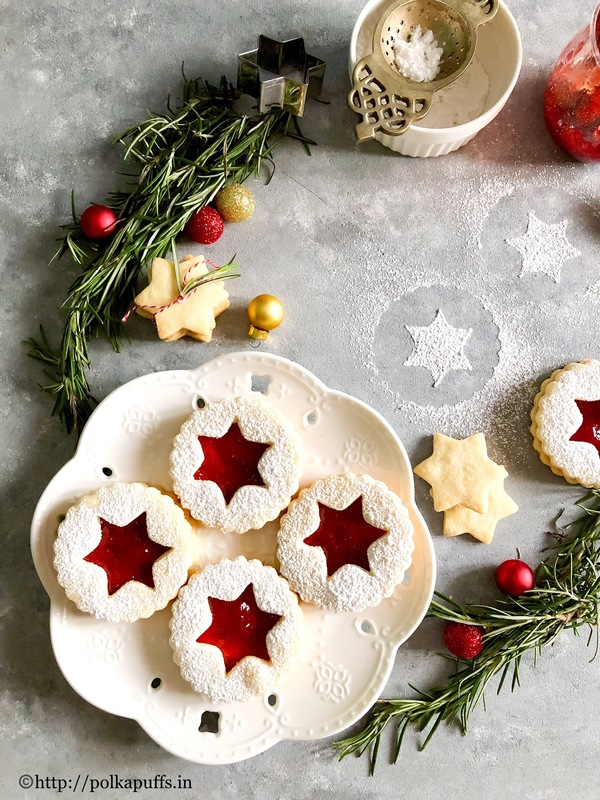 Once chilled, portion the cookie dough in equal sized balls, flatten them using a fork and place them an inch or two apart as they spread on a parchment paper lined baking tray. 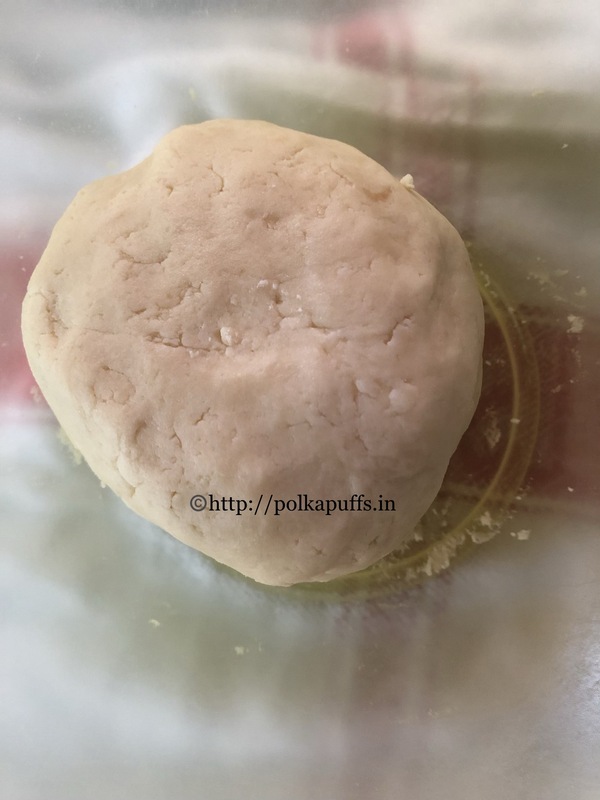 Chill the portioned dough balls again for 15 mins in the refrigerator. 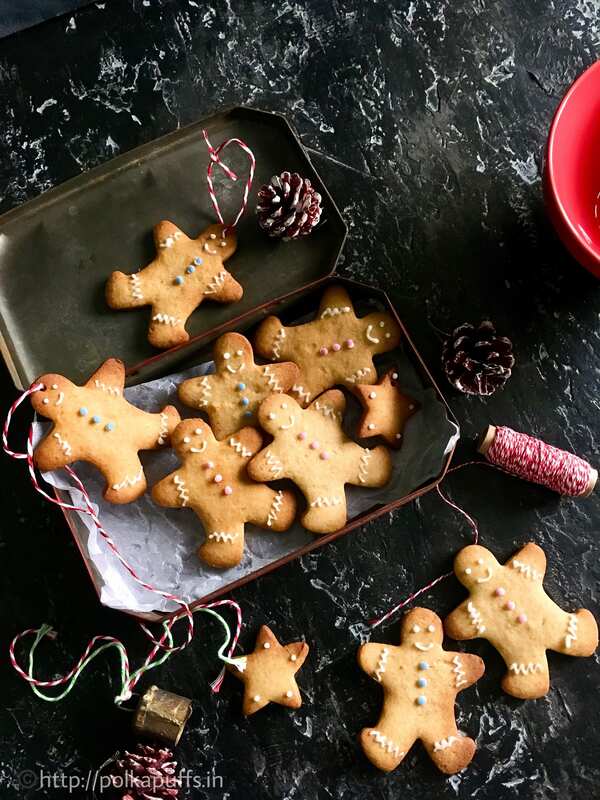 Once the cookies are baked, take them out of the oven, let the cookies first rest on the baking tray for 15 mins as they continue to crisp up further. Then transfer them on to the cooling rack for another 10 mins. Once they are completely cooled, store them in a parchment lined airtight container.